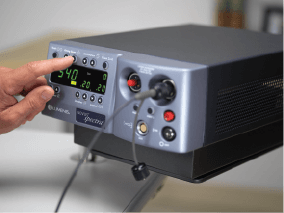 The Lumenis Novus Spectra® is an innovative photocoagulator with an extensive set of features that deliver power and reliability with proprietary advancements in diode-pumped solid-state technology. Provides hands-free power adjustment of the laser by toggling left or right within the footswitch housing. 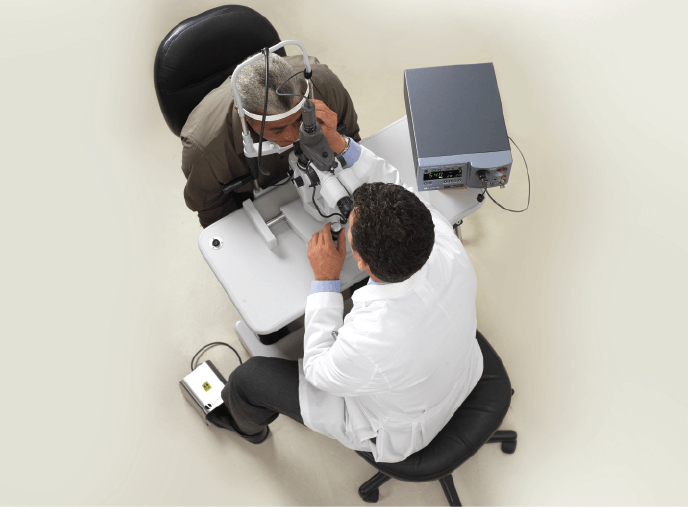 Choose a Laser Indirect Ophthalmoscope that suits your preferences. Both our Heine™ and Keeler™ models are rugged, lightweight and equipped with the most advanced laser delivery technology in the market. The Lumenis family of LaserLink Slit Lamp adapters will transform most commercially available slit lamps into advanced laser delivery devices with superior optics capabilities. A selection of automatic and fixed eye safety filters for the Slit Lamp with the Lumenis patented ClearView™ technology. The photopic balanced coating eliminates color distortion of the treatment site while optimizing white light transmission or “brightness” of the physician’s view. A comprehensive and wide selection of ophthalmic probes to meet every clinical need and indication. These include standard, straight, curved, aspirating, illuminating and stepped in 20, 23 and 25 gauge sizes. 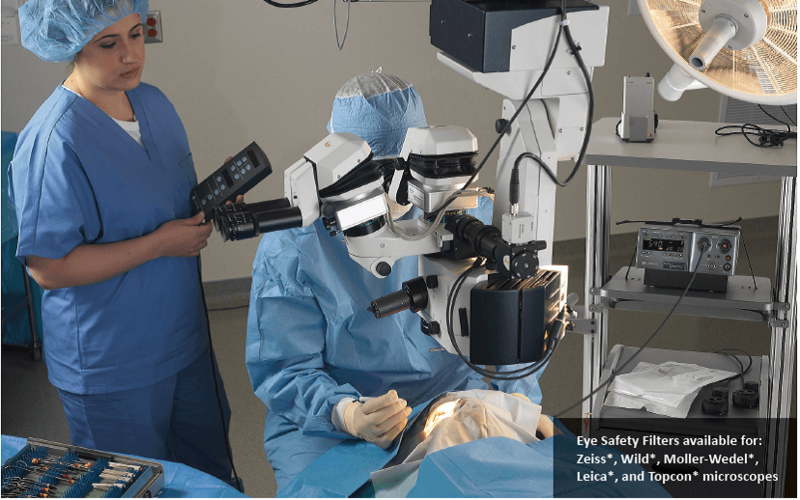 Surgical microscope eye safety with the Lumenis patented ClearView™ technology. The photopic balanced coating eliminates color distortion of the treatment site while optimizing white light transmission or “brightness” of the physician’s view. The Lumenis *PowerEase™ footswitch provides hands-free power adjustment of the laser by toggling left or right within the footswitch housing. 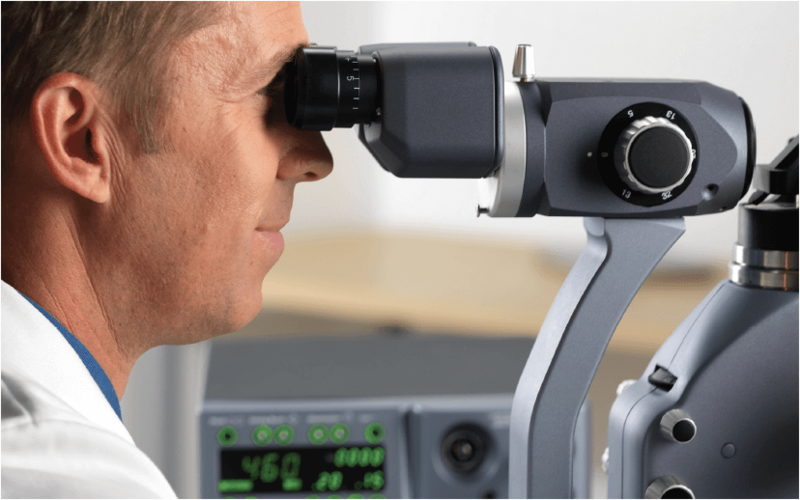 Superior Optics – Homogeneous laser spot at target tissue Our advanced optics and laser delivery technology features uniform energy distribution across the entire laser spot area for more precise and safer treatment. The result is a homogenous laser spot with evenly distributed power across the full area of the spot, eliminating the potential risk for the formation of “hot spots”. ClearView™ Filters – Optimized view of treatment site The Lumenis ClearView™ filters’ photopic balanced coating eliminates color distortion of the treatment site while optimizing white light transmission or “brightness” of the physician’s view. A proprietary coating protects the filter from environmental changes and scratches. Vision One incorporates SureSpotTM Optics Technology in all slit lamp adapters, as with all Lumenis photocoagulators. 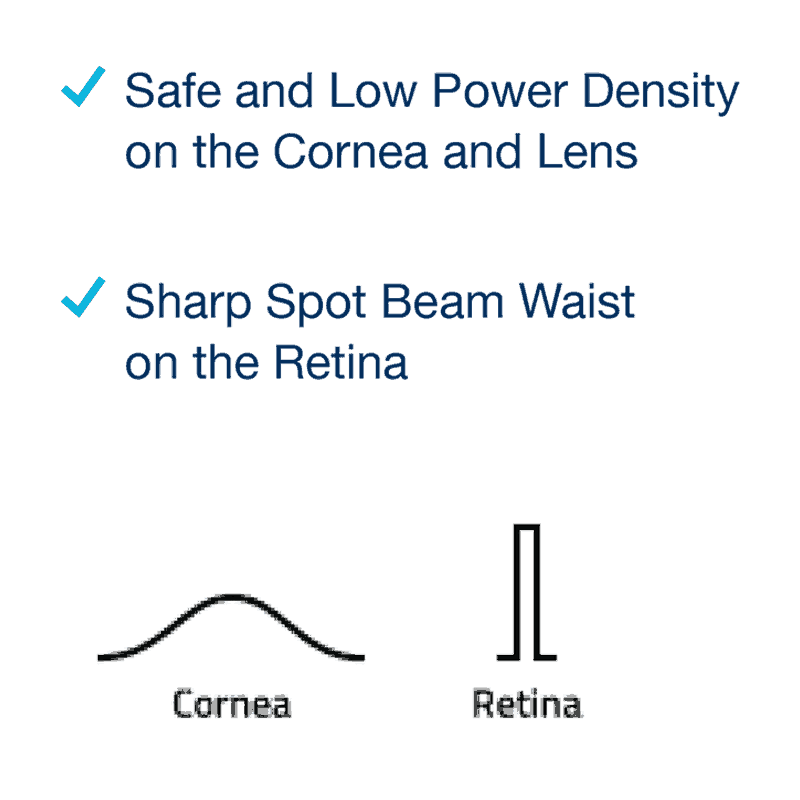 The unique and patented Lumenis SureSpotTM technology ensures that the focal point of the laser beam is maintained on the retina while power density on the cornea and lens is minimized for increased safety. lasers that may have a 100µ minimum spot size and/or project a fuzzy laser spot on the ina. 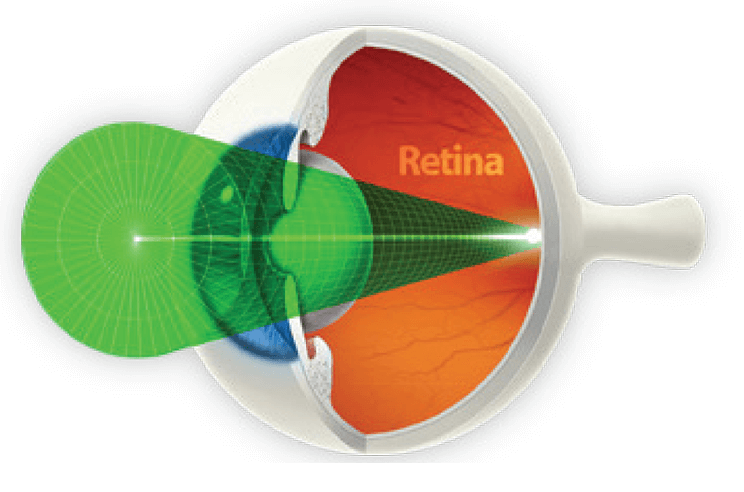 SureSpotTM optics improves treatment efficacy and precision while reducing the potential for damage to anterior-segment tissues. The latter occurrence is especially a concern when using wide-angle lenses that enhance light uptake by the cornea and lens.